If you are looking for a charming, friendly and clean hostel in an amazing location - look no further! Villa Zorana is a modern and stylish hostel is situated just 4 minutes away from the city center & the famous bar 'Carpe Diem.' There is a supermarket and a delicious restaurant located just 100m away. We are in a perfect location to reach some of the nicest beaches on the island. We are a family owned hostel that has been in the tourist business for 30+ years. 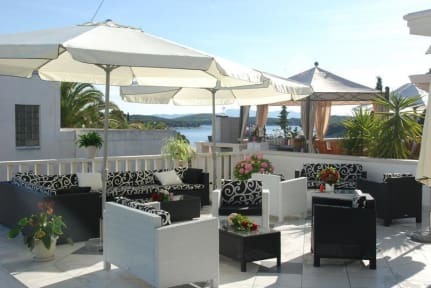 We are more than happy to assist you with any and all needs you will have while staying in Hvar. Your time with us will not only be pleasant but also safe and secure. -Standard Dorm room sleeps 8 with its own private bathroom and air conditioning. -Superior Dorm room sleeps 8 and has 2 private bathrooms and air conditioning. -Superior Double Bed Private rooms are big rooms with a balcony, sea view, and private bathroom. -Superior Twin Private rooms are big rooms with a balcony, sea view and private bathroom. -Standard Double Bed Private rooms are smaller rooms with a private bathroom. -Superior 4 Bed private ensuite is huge apartment with two big rooms, a kitchen, air conditioning, balcony and sea views. It's the best apartment in Villa Zorana. It can be suitable for 6 people because it's enormous. We have an outside kitchen and inside kitchen. They are fully equipped and free for guests to indulge in some of their own home comforts. We also have a garden lounge area and a terrace lounge area with a sea view and plenty of space for relaxing, meeting new friends, and enjoying the sun. Through us you can rent a scooter, bicycle, car, or boat! We can help you arrange excursions on and off the island, like trips to the blue and green caves & nearby islands. Free map, free internet access and free Wi-Fi for all our guests! There is no need to worry when staying with us. We provide all the information you need to know about Hvar, like what are the best restaurants, best beach clubs, bars, etc. We guarantee a pleasant and unforgettable time at Villa Zorana. We hope to see you soon! No curfew, no lock down. Please note: If you book and don't show up your credit card will be charged for 1 night. We were welcomed very friendly with delicious ice cream and a good explanation about the island and what we could do in Hvar. The room was very comfortable and especially, we liked our terrace and the view very much. Recommendable stay!